Lemme go Dad...lemme go...I wanna run around...lemme go! 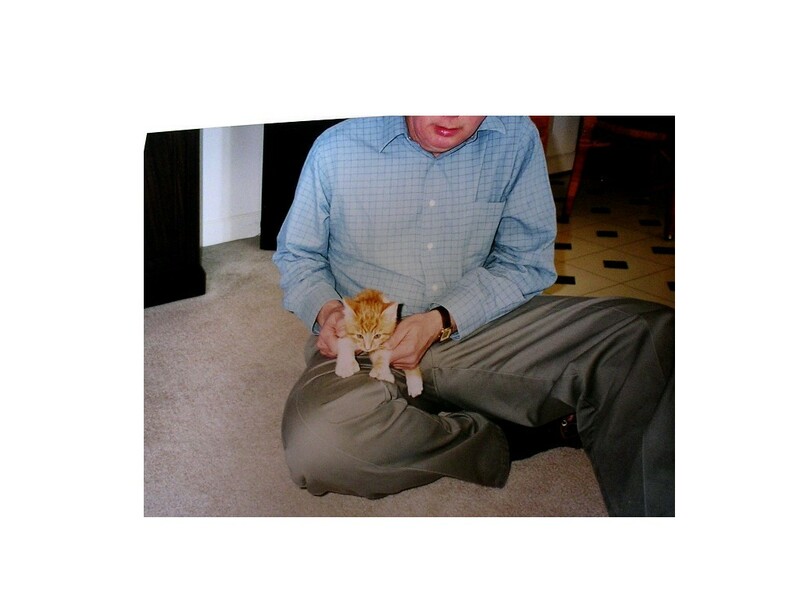 Gee, this picture makes me look pretty small…..Daddy couldn’t keep me on his lap for long – I just put my little “tractor paws” in gear and off I’d go! HAHA One advantage to having big paws with extra toes – it was hard to hang onto me for long. Nowadays, it’s hard to get me to move……..I much prefer a long and luxurious nap in one of my favorite spots. I can remember when Mom took this photo though – – – Dad was a little bit “out of his element” when I first came to live with them. He had very little experience with cats……he’d had a dog for 16 years when Mom first met him……he didn’t “get” cats. His dog had been totally dependent on him and having an independent kitten running around the house was a BIG adjustment! Mom knew all about cats. I didn’t have to train her at all! Anyway, I worked hard on getting Dad to adjust to having a wild kitten around the house…I’d pop up in the most unlikely spots just to keep him on his toes. In a big three story house like this, I had lots of places to hide and wait until he came by – then I’d jump out and scare him. Wheeeeee! Nowadays of course I’m much more dignified and settled down….that’s not to say that I don’t work hard at keeping my parents on their toes though. Lately my favorite thing to do is hide somewhere and not answer when they call me. HAHA Then they have to search alllllllllllllllllll my hiding spots in the whole big house looking for me. I figure it’s good exercise for them at their age. That’s another thing………we’re ALL growing older together. How cool is that? Still, it’s fun to look at all these old photos and remember when I was just a baby and we were all adjusting to each other. The beginning of my life as ONE SPOILED CAT! I know. I know. It usually take my various dogs I have had about a year to totally dominate me and then the training can commence. HAHA! From what Mom says, Zoe “had your number” pretty early on Uncle Jerry! Some humans take more WORK than others….I think Zoe’s had it pretty darn good in your case – you two were truly made for each other! I can just picture Sam jumping out and startling Dave! Just think of all the wonderful places you’ll have to explore when you move, Sam! I want pictures of the new screened in porch you’ll love hanging out in! Hi Miss Trish! Oh you better believe I’ll make sure Mom takes LOTS of pictures of MY screened porch…..I just wish we weren’t having to wait so long to GET IT !!! !